I said our Jetsons family costume last year would be it as we are running out of room (other previous costumes include our ‘Flintstones Family’, ‘Chips & Buds Spud Wagon’ as well as a ‘Pest Control mouse trap’, all of which included a mobile vehicle! ), but I couldn’t resist adding to the Hanna Barbera roll we’ve been on the last couple years by going ahead with a Scooby Doo! Family costume. 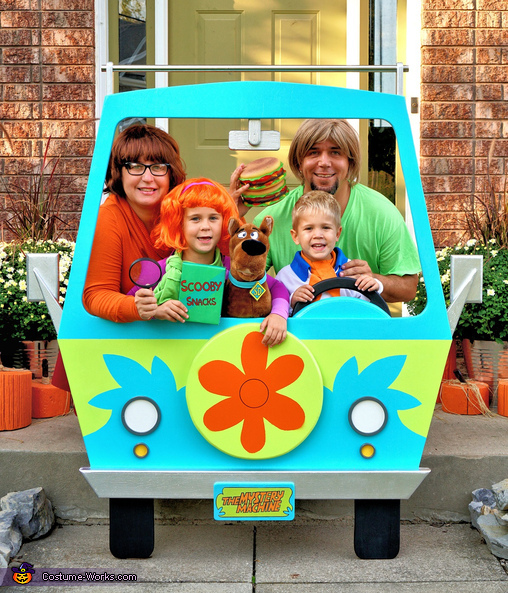 My wife and I were Shaggy & Velma, while our kids were Daphne & Fred. As with my previous costumes, I knew I had to build a Mystery Machine of sorts to top it off. •Shaggy – an oversized bright green t-shirt with baggy burgundy pants and black boots, topped off with a dirty blonde wig and two burger squeeze toys to top it off. •Velma – a cowl neck orange sweater and knee-high socks with a burgundy skirt and shoes, topped off with a chestnut bob-style wig and oversized magnifying glass. •Daphne – I actually found the dress on ebay which was a very close match, added pink stockings, purple shoes and headband with a bright orange wig and used a cut up t-shirt for her scarf. The Scooby Snacks box is a printed image wrapped around a hunk of Styrofoam. •Fred – a long sleeve collared shirt that I sewed an oversized blue collar onto with two orange headbands cut and sewed to create an ascot then finished off with blue pants and brown leather boat shoes. •Scooby-Doo! Can’t forget the main character – we actually already had this stuffie on hand which helped make the decision for this years’ costume! The kids have gotten too big to push around in a full size ride-on car (like our previous Mouse Trap, Spud Wagon, Flintstones Car & Jetsons Spacecar), so I opted to simplify the approach and build only the front end of the Mystery Machine. It is made almost entirely of ¾” plywood. I used the full 48”width and scaled the drawing from an online image I printed off carefully measuring every dimension, but extended the roofline an extra 6” in height to provide enough room for all of us to cram in for a group photo. I first cut the shape of the main car out and routered the edges. Rather than just paint a flat piece of plywood, I wanted to add some dimension to it for a more realistic look which included a double thick spare tire, front bumper made from a 2x4. The headlight rings were cut from ½” plywood while the steering wheel, dash , roof rack mounts, rearview and side mirrors were made from the scraps leftover from the original piece of plywood. The roof rack bar itself is half of an old shower curtain rod. Next came the paint, which gave me some headaches as the primer didn’t stick well on the main body so I had to sand it all down and start over at one point. Due to time constraints and weather getting worse, I opted not to prime it the second time around. I hand drew the flower for the spare tire and painted with a stencil cut from bristol board, purposely unsymmetrical as it was in on the image I as copying. The scallops were drawn on bristol board, then flipped over for a mirror image on the other side. I taped off the main body to pain the green and turquoise colours, then hand painted the tires, headlights, turn signals and rings. The license plate is a printed and laminated image from online that is glued to a ½” plywood backing. The biggest cost for this project comes from the purchase of the ¾” plywood ($60); however there is probably another $100 or so in the paint/thrift shop clothing/felt/accessories. The Mystery Machine took a few weeks to build with limited time and some hassles with the paint, while the costumes only took a few days once my dear wife collected all the necessary materials. All in all, it was a fun project and I am once again quite happy with how it all turned out!